Pressure Cooker Split Pea Soup is a perfect way to use up your leftover holiday ham. Split Pea Soup is so comforting and delicious and reminds me of a quiet and stress free time in my life. 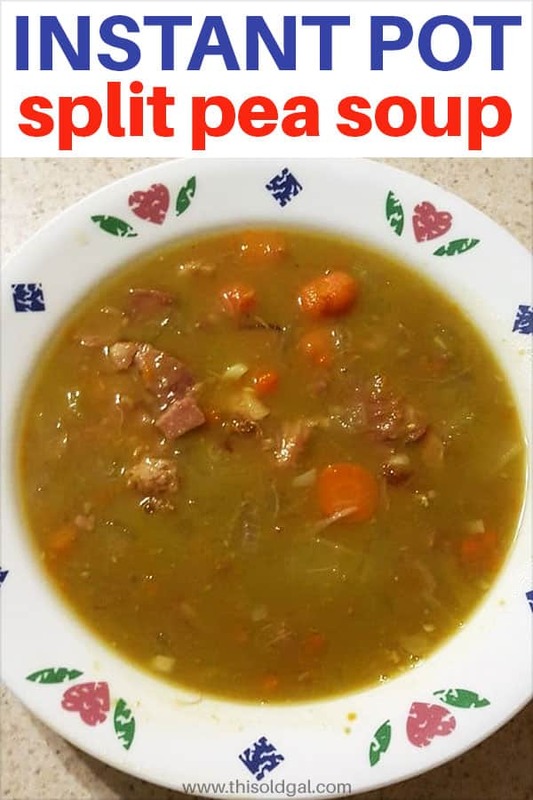 It seems after holidays, people want recipes to use up their hams and Split Pea Soup is a great way. Another fantastic use for leftover Easter or Christmas Ham is Holiday Party Ham Buns, which are easy to make and so delicious. They are popular in the Southern States and very popular in the Cuban community in Miami, which I am from originally. Pressure Cooker Split Pea Soup is delicious any time of the year. So, don’t just wait until after a big holiday to make some homemade soup that is so warm and comforting to your soul. I like to start with a very super gelled ham bone broth. 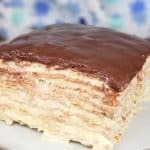 It is easy to make in the Pressure Cooker and then remove the thick fat layer after refrigerating. 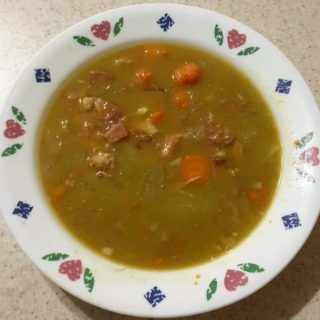 You can also make the Split Pea Soup from start to finish with the ham bone and ingredients all at once right in your Instant Pot or Pressure Cooker. 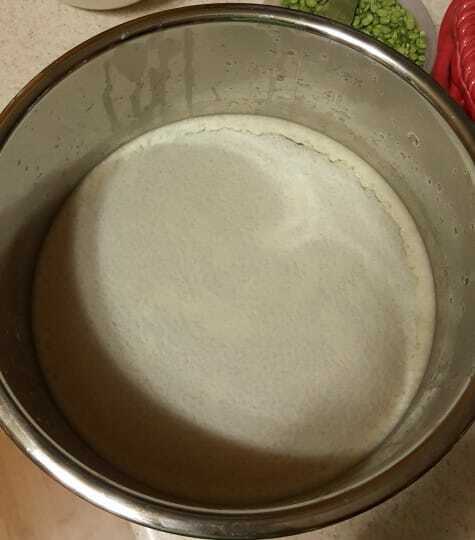 This is the result of making ham bone broth in advance. You end up with a nice and clear, mostly fat free gelled broth. 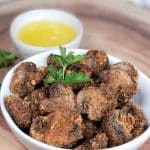 This recipe is from ham bone broth. 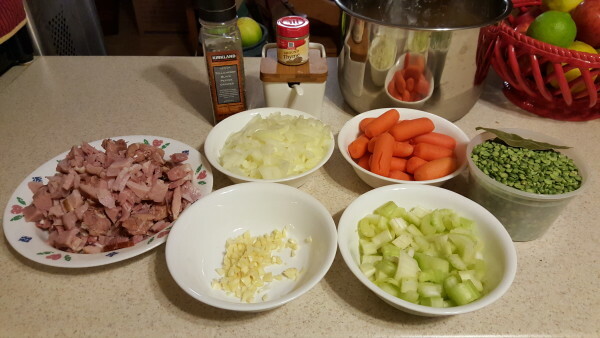 Sauté the onion and celery and then add in the broth, carrots, broth, ham garlic, split peas, thyme and a bay leaf. Lock your lid in place and set the timer for 10 minutes. 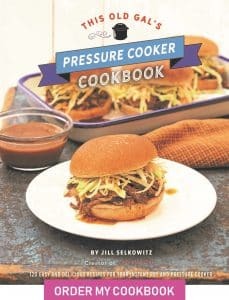 Always allow a full natural pressure release when doing soup, otherwise, you will have a kitchen full of soup. Serve with some warm Pressure Cooker Holiday Corny Cornbread. Push the Sauté button on your Instant Pot/Pressure Cooker. Add the olive oil to the pressure cooking pot. Add the onion and celery and sauté for five minutes. Add broth to the pressure cooking pot. Rinse split peas well and pull out any rocks. Sprinkle in a little thyme and add a Bay leaf. Add fresh water up to the fill line. Lock on the cover and push the value to seal. Push the Manual Button and set time for 10 minutes on high pressure. PIN this Pressure Cooker Split Pea Soup! Does this really use 5 QUARTS of broth? I don’t think my 6 qt. Instant Pot will hold all of that plus the other ingredients. 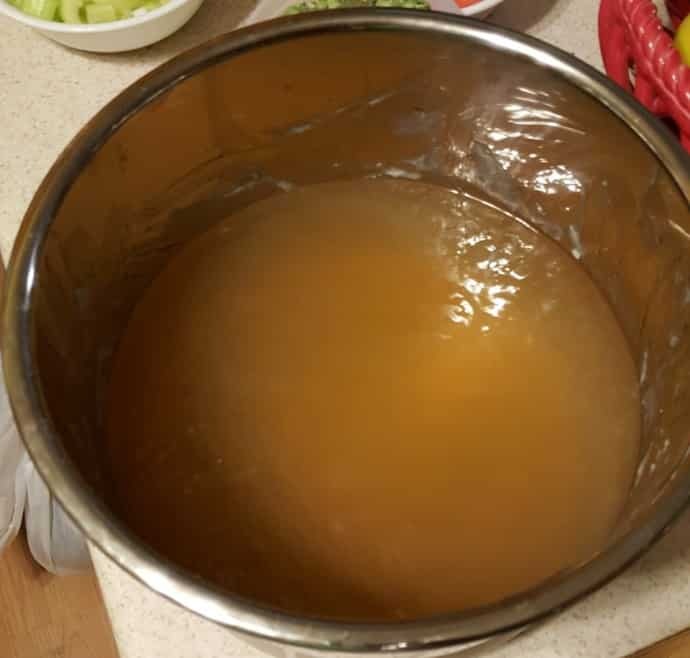 I made my ham broth separate and the day before, so that I could remove the thick layer of fat after cooling in the refrigerator overnight. Then, I used the thick gel ham bone broth and added more water to get to the five quart line in the pressure cooker. Are you using the bone in the recipe to get the broth, or do you already have the ham bone broth? I haven’t done anything for it yet. I was just surprised that it used such a large quantity and wanted to make sure it wasn’t a typo. Working in Afghanistan and looking into buying an Instant Pot and pea soup is one of the first items I’d like to make. But finding a ham hock or bone to make stock from will be tough to find. 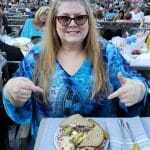 I can get ham slices but that’s about it. I’ll ask our DFAC (dining facility) if they plan on cooking whole ham for the upcoming holidays. Beyond that, what would make a good stock for pea soup? I should be able to order chicken, beef or vegetable broth or bullion and liquid smoke. I prefer the good old way of making pea soup with a hock but we’ll see. Will use the same idea for making Navy bean soup. Thanks! Ham slices will work. You can also use ox/beef/chicken bones to get a nice stock first, if you cannot get the ham hock. Then add the ham slices for the flavor. Of course, if a whole ham is good, getting the bone would be best. Buillion cubes help a lot also when your meat choices are limited. 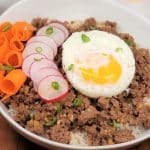 How would you modify the recipe to skip making the broth and just starting with the bone? First of all it was delicious!!! But it came out super thick. I needed more clarity on how much water to add. . I used some ham broth that I had frozen and added two cups of water. I now know for next time to add more water, but this was the first time I’d made soup in instant pot. Didn’t want my ceiling full of pea soup. I just had to put in in a pot with water on the stove to thin it. I want to throw the ham hocks into the soup when I make it. Would that work? How long nder pressure? 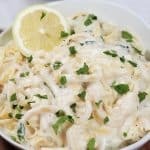 I love youe recipes bythe way! The recipe calls for Ham Bone Broth. Looked up bone broth on your page and I did not find a pure ham broth. Did I miss it? Wanting to try the recipe tonight, of course, with no time to prepare the broth – I will know for next time. Please direct me to the recipe. Hi Jill. I have looked all over and maybe I’m missing it (that’s probably what happened) but how do I convert this if I’m not using premade ham broth and I just have the bone? Do I just add a lot of water? This was delicious! 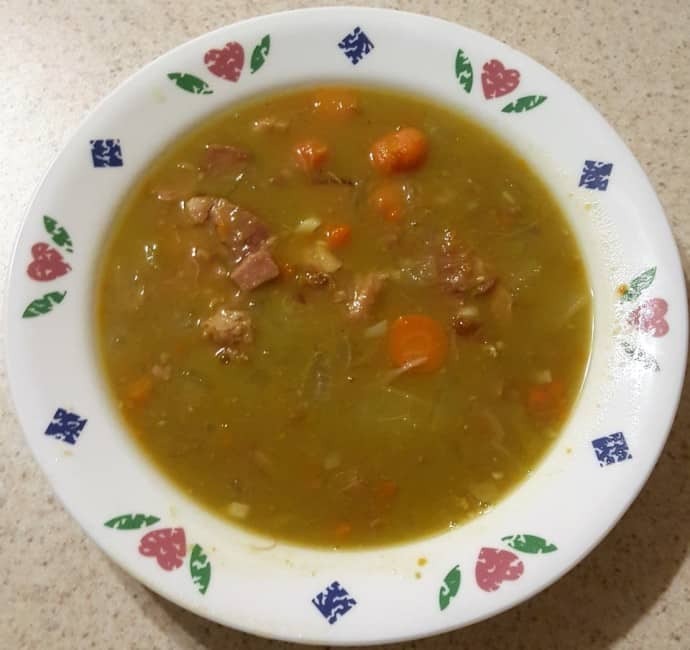 The best split pea and ham soup I have made, family devoured it. I used fresh thyme, chicken broth because that’s all I had and added a little smoked bacon and smoked paprika to help bring out that smoky flavor. YUM! Should also have added that I used the ham bone from the christmas ham instead of chopped ham. Very excited to try this tecipe, but like many other people I’m missing the instructions how to make it directly with the bone. Do I just use the soup ingredients and add the bone plus plain water? And most importantly; the broth recipe calls for 240 minutes (that’s 4 hours!!!!) on high pressure. Are you sure my instant pot won’t explode or something during that time? And if that time is correct, does making the soup with the bone in the pot also take 4 hours on high pressure (instead of 10 minutes, as your soup recipe says)? Those are vastly differing numbers! And lastly, the bone broth recipe says that the bone will crumble apart and a strainer of sort would be useful. 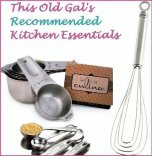 I don’t have a strainer or steamer basket, will I have to fish for bone pieces in my soup? Hope you can clarify the whole bone-in version of this soup.